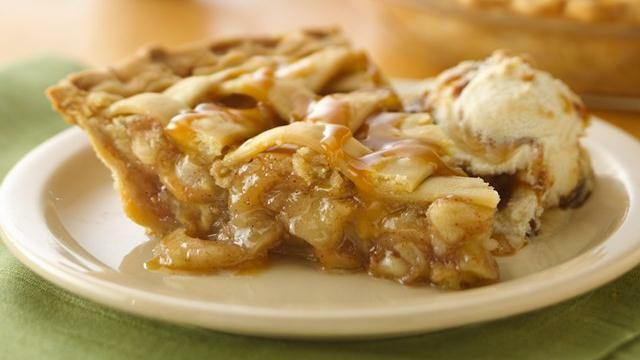 Apple Pie is both a seasonal and an American classic. Granny Smith apples and caramel sauce in this Caramel Apple Pie Recipe step it up a notch making it a decadent treat for winter gatherings. Let’s face it, these are culinarily adventurous times, where we want to experience new and exciting flavors without giving up the traditional tastes and recipes that we love. That’s where this Granny Smith Caramel Apple Pie comes in. At first glance, it may seem like there are a lot of steps, but its actually an easy recipe that would even be great for involving kids or grandkids. Have them unwrap the caramels to make the sauce or get their hands into the bowl of streusel topping. Granny Smith apples are the perfect choice for this pie because they hold their shape and crispness in baking and their light texture and tart flavor notes play well against the rich and decadent caramel and streusel topping. You can personalize it by using your favorite nuts, like pecans or walnuts in lieu of the nut topping. The crunch both in and on top of the pie adds great texture and interest, modernizing this traditional favorite. Great with ice cream, and decadently superb all on its own. Mix together the dry ingredients and make a well in the center. Add the oil and milk (keep more milk if too dry). Press dough into the pie plate - starting with the edge and working towards the middle. Unwrap and add half the bag of caramels to a microwave safe bowl. Add 1 tablespoon of water and microwave on high for 1 minute. Stir. Return to microwave and cook for about 1 more minute. Stir well. Keep warm. Peel and slice the apples, toss with sugar, flour and cinnamon. Line prepared pie crust with caramel sauce and nuts, place apples, dot with butter and top with streusel topping. If you do not want the edges of your crust to get to brown, wrap the edges of your pie plate with aluminum foil. (You'll need to check the pie the last 10-15 minutes and remove the foil if the edges are too light.) The pie bakes at 375 degrees for 45 minutes or until the apples are tender when pierced with a fork. Melt butter, stir in sugar and flour; let rest for 5 minutes and then stir with fork and crumble over apples. Drizzle caramel over top of slightly cooled pie and sprinkle with nuts.